Specifically developed for horses and ponies that could do with some extra immune support. Nettle improves the extraction of waste products. Milk thistle cleanses the liver and has a liver building function. Organically bound selenium and zinc are easily digestible and essential for a properly functioning immune system. Organically bound minerals: selenium, zinc, manganese and copper. To be used as a cure. 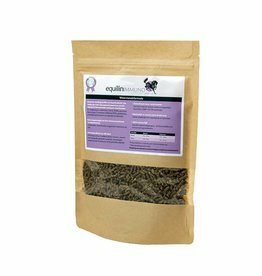 We advise to feed EquilinIMMUNO a maximum amount of time of 6 weeks (2 bags for a regular sized (550kg) horse). You can feed it safely for a longer period of time, however the herbs will lose their effect. We advise to switch to EquilinBASIC after six (6) weeks, if required combining it with EquilinBALANCER. Please be aware! A diagnostically proven allergy will not disappear with a change in diet. However, the reaction of the body to an allergic stimulans can be positively influenced with high quality feedstuff. #Obviously management needs to be looked at as well. For example: in horses suffering from Sweet Itch the use of Sweet Itch Rugs is advised.